The LRH reply was essentially twofold, and if originally prompted by a recognition of what drugs represent as a spiritual stumbling block to former users entering Dianetics and Scientology, the application of his methods have proven very broad indeed in the secular realm. First, and perhaps most talked about, is the Purification program. Consisting of a carefully designed regimen of nutritional supplements, exercise and sauna, the Purification program has proven the only means of eliminating residual drug particles and toxins from fatty tissues. That fatty tissues tend to form a repository for drugs and toxic substances was, in fact, an LRH discovery and ultimately led to much of what we now know as environmental medicine. LRH work in the field also led to a whole new appreciation of how drugs may adversely affect us years after ingestion and how the problem is by no means limited to illicit substances, but includes both medicinal drugs and environmental pollutants—all accounting for the popularity of the Purification program among every sector of society. 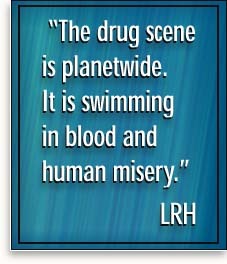 The second aspect of the LRH solution utilizes rehabilitation procedures drawn from Dianetics and Scientology. In broad terms, these procedures address the mental and spiritual trauma attendant to drug abuse—what originally prompted usage, the immediate physical consequences and subsequent memory loss, impaired reasoning and inabilities to concentrate. If the statement seems in any way academic, it is not, and results are routinely astonishing with dramatically improved health, perception, emotional stability and utter freedom from the need. The ramifications are immense, and even more so when considering the telling pattern of violence within the 28 thousand Adverse Reaction Reports from the Prozac file, or the Canadian study finding tranquilized inmates of criminal facilities twice as prone to violence as their unmedicated cellmates. Then there are the equally disturbing studies linking Valium, Haldol and Xanax to extreme acts of societal violence, very much including that late twentieth- century phenomenon, the inexplicable killer in a fast-food restaurant or a metropolitan subway. It is premature to extrapolate further or to ponder the inevitable next question: Has this biochemical society, this Prozac nation as the phrase goes, actually spawned a new brand of human being—whether subhuman or inhuman, but unspeakably violent? In either case, the issues here are supremely important, and when L. Ron Hubbard speaks of drugs as the “single most destructive element present in our current culture,” he is not simply adding to the rhetoric; he is speaking from a knowledge of biochemical phenomena that is very truthfully a revelation, and then offering a solution that is just as truthfully our only means of cultural salvation. In addition to a general discussion of L. Ron Hubbard’s rehabilitation methods, we shall examine his work within the larger historical context and particularly as regards the political impetus behind unbridled drug abuse. We shall also examine what LRH discoveries have revealed regarding drugs as an agent of societal control, and much more of what he described as the “brutal truths” of this subject. As a final introductory word, however, let us understand that while drug use has probably become the most popularly opposed social ill, with every mother’s bumper sticker exhorting kids to just-say-no, the problem has hardly been faced full-on. With that in mind, here is how L. Ron Hubbard saw it, and here is what he did about it.